In the face of uncertain revenue and rising costs, colleges and universities look to their advancement offices to help maintain their financial stability. Yet fundraising is rarely easy, and for Catholic institutions, affiliation with the Church may bring additional challenges. Retiring ACCU President Michael Galligan-Stierle offers ten lessons from his life in Catholic higher education. Today’s Catholic college and university presidents take their role as stewards seriously. A recent study examines how they are laying the groundwork for a strong future. Cultivating a servant-leader happens through experience and reflection on that experience. Looking beyond service-learning projects, what can a university do to provide meaningful opportunities for experience, reflection, and role-modeling? Under the theme “Mission, Myth, Money: Securing Catholic Higher Education for the Future,” the 2019 ACCU Annual Meeting brought forth ideas to advance the sector’s unique mission, break the myths that call the value of higher education into question, and secure funds in a changing educational and religious landscape. Over the course of U.S. history, religion has garnered varying degrees of attention in college classrooms, reflecting shifting attitudes toward secularization. In this feature, the author examines the changing nature of higher education’s engagement with religion. Note that the summer 2019 edition of Update will not be published. 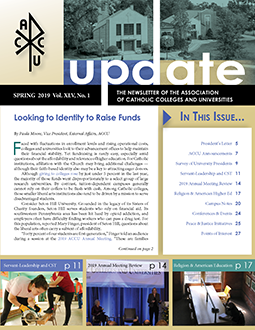 The newsletter is scheduled to return in fall 2019.